What is Residential School Syndrome? While the symptoms are similar to post traumatic stress disorder, the cause is very different. Between the 1870s and 1996, approximately 150,000 children attended 139 residential schools. The schools were federally administered but managed by Anglican, Catholic, Presbyterian and United churches. 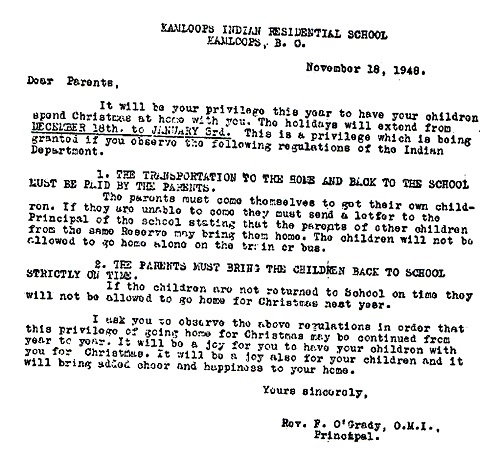 The intent of the schools was to assimilate, integrate, and educate Aboriginal children into the colonizer society. Children as young as four were forcibly removed from their families and communities, were forbidden to speak their language, dress in their own clothes, or practice their culture, and were punished if they did so. The children were forced to do manual labour, were poorly fed and in some situations, food was withheld for malnutrition experiments. Parents who tried to shield and hide their children were punished, sometimes imprisoned. Children were allowed to return home for holidays but always with a warning of what would befall the parents if the children were not returned. Despite being in “school” many children received a substandard education. They were supposed to be instructed in math, science and English but frequently were out of the classroom for chores or punishment; also, according to a Department of Indian Affairs (now Indigenous Affairs and Northern Development), over 40% of the teaching staff did not have professional training as teachers. When those children, after years of being forced to behave, speak and think like European Canadians, did return to their family and community as young adults they frequently did not fit in. Their connection with their culture was either damaged or lost altogether, same with their language, their connection with the land, with oral traditions. Because they had not experienced parental love or nurturing, they in turn did not know how to love or nurture their own children. Because they had suffered abuse and trauma many learned to abuse others in order to survive. When approximately 150,000 children experience trauma, physical and emotional abuse, shame, neglect, feelings of abandonment (neither they nor their parents understood why the children were being taken), marginalization (from their community and society) and racism and all of that is unresolved, those experiences and emotions are internalized. Those internalized emotions manifest as depression, anxiety, addiction, suicidal inclinations, rage, and mental illnesses - this is residential school syndrome. The Truth and Reconciliation Commission spent four years travelling across the country gathering statements from survivors on the effects of their experiences in residential schools. In June 2015, a report detailing those effects and making 94 Calls to Action was released. This can be a very difficult topic to discuss and it makes many non-Aboriginal people uncomfortable when challenged with statements about residential schools. In our training we discuss residential schools and appropriate responses. Contact us to learn more about our training - we can customize them to fit your particular needs. Here's a free ebook with 23 things to not say or do.